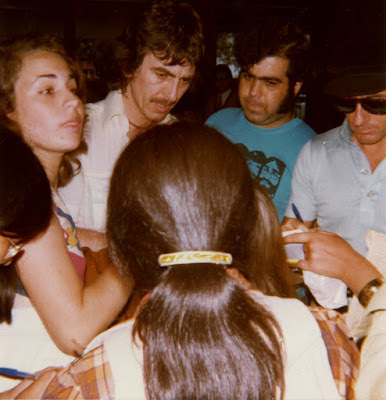 Photo taken February 2, 1979 during George's trip to Brazil. I love the guy in the blue Beatles t-shirt. Whoever originally owned this photo wrote on the back "I'm the girl beside George!" (with a heart in the o of the word George). A day these fans will never forget. Astrid is beside George and Noemi is in front of him.